No matter how hard you try to have all the bases covered there just always seems to be one chair short, or just not enough table space. Bounce Orlando has the extra tables and chairs available for rent, so you're always covered. 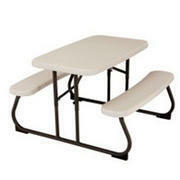 Folding chairs and tables, even picnic tables. Browse the selections below and click on the title or image for more information and to make a reservation.